Just because school's out for summer doesn't mean the learning has to stop. In fact, when you're outdoors, there's always something new to discover -- especially at the beach! Ever wonder what that cute little fuzzy bird is running back and forth to the water? How that shell got a perfect hole in it? Or what sand really is? Where there's a question, there's an answer. Next time you head for the coast, bring along this collection of interesting coastal facts to share with your kids. 1. What is sand made of? Much of our beach sand in Massachusetts is made up of quartz and it can take sand 1 million years to move a measly 100 miles. 2. 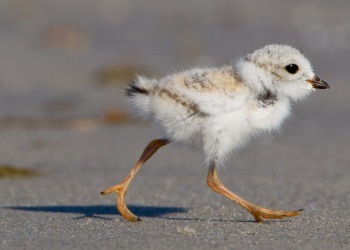 Why do piping plovers need protection? See any roped off areas on the beach? It's probably there to protect the piping plovers, an endangered bird species that thinks our beaches are the best place to raise a family. Those tiny cute fuzzy ones with long legs? Those are the chicks and they can run up to mile on the first day of its life. 3. 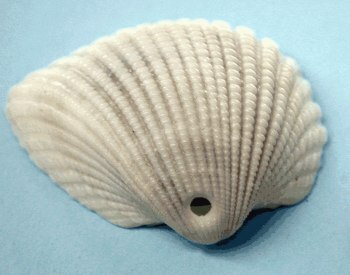 Why do shells have holes in them? If you find a shell with a small perfectly round hole in it, there's a good chance that the animal that inhabited that shell was eaten by the carnivorous moon snail. This snail uses a combination of its tongue-like radula and a compound similar to stomach acid to bore a small hole in the shell of its prey. 4. Are horseshoe crabs dangerous? 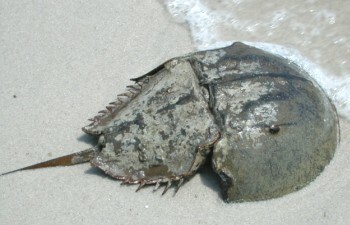 The Atlantic horseshoe crab has been crawling ashore to mate on full moon nights in spring for about 350 million years. While it looks dangerous, its long tail (aka a telson) isn't a weapon. Instead, it helps the animal flip itself back over when its vulnerable stomach becomes exposed. 5. Why does that crab have two different shaped claws? Notice a little crab with two different shaped claws? 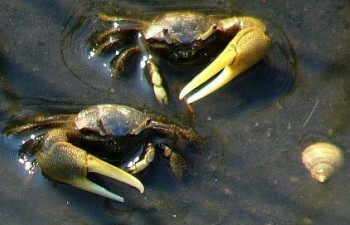 Those are fiddler crabs. They got their name because it looks like they are playing the fiddle when they eat with the small claw. The extra-large white claw on the males is a chick magnet. Really. The crabs use it to attract females by waving it like a peacock would display its feathers for its mate. Even cooler, if a claw somehow comes off, the crab will just grow a new one. And there's more where these came from. Check out all the great Mass Audubon seaside family programs happening this summer on the Cape, North Shore, and South Shore. And a big thanks to Amy at Wellfleet Bay Wildlife Sanctuary for sharing her wisdom! Image credits: piping plover by Shawn Carey, shell by National Park Service, horseshoe crab by US Fish and Wildlife, fiddler crab by Richard Johnson. All images via Mass Audubon. Up your summer trivia game by learning these 5 fun beachcombing facts.